This wasn't quite my kind of read but I've read similar books in the past so thought you'd like to hear about it! John kindly agreed to do this guest blog post in place of a review from me. Cheswick Redbrush is young, clever and really quite red – he is a red squirrel. The peace-loving reds live a simplistic life in the respectable pursuit of the perfect nut. But this harmony is about to change. When sails appear on the horizon one day, Cheswick and the rest of the community assemble on the beach, both intrigued and excited. And when an enormous grey squirrel sets foot on the sand and announces that everything’s about to get a whole lot better, then why shouldn’t the reds believe him? But the sweet dream quickly turns sour when Cheswick discovers that the visitors are only interested in destruction and conquest. This enslaving Grey Empire is under the brilliantly evil leadership of Cornelius Shadowtail and his thuggish sidekick, Scug Butcher. The Ghost of Crow Cavern examines how ruthlessness and cunning can turn a peaceful world into a world of terror and subjection. But can such a brutal regime last forever? Cheswick will try his hardest to ensure that it doesn’t. The idea for ‘The Ghost of Crow Cavern’ stemmed from a simple observation. When I moved to Finland I noticed that the squirrels are red and at home in England they are grey. When I looked into the reason why I found out they used to be red in England but their numbers seriously depleted when a larger grey squirrel species was introduced from North America. The truth about the depletion of the red species was, in the main, caused by the reds not having protection from certain viruses which the greys carried. But I imagined an invasion, fight for survival, resistance, bravery, heroes and villains. The great thing about the world of fiction is that one is free to write what is in one’s imagination rather than having to adhere to hard facts. This is one of the reasons why particularly children are able to write amazing stories, their imaginations can run wild which makes for very exciting fiction! By sheer chance I teamed up with my dearest friend from my childhood. We used to write stories when we lived in the same street as nippers and while writing ‘The Ghost of Crow Cavern’ the old enthusiasm came flooding back. We were 10 year olds again who were letting their imaginations run riot! Shadowtail is extremely learned and intelligent and very confident. He speaks softly and articulately but if you judge a squirrel by his acts, he is utterly ambitious, sinister and ruthless. The combination of his character creates a cocktail of villainy and it will take something very special to stop him executing his dark plans for red squirrels of Nutshaven. Our biggest hopes are that the readers enjoy the story. We hope that they get to be stimulated by the characters and the struggles they are forced to endure and we hope that the book’s message which is ‘no matter how difficult things can become there is always hope’ shines through. If the book is received well by the readership hopefully we would be asked to continue the story and write a series. 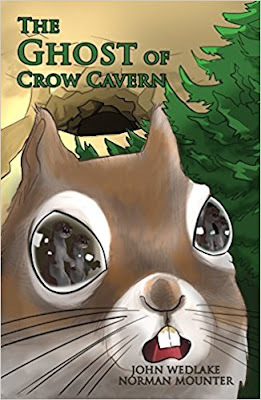 If we are allowed to dream we think that ‘The Ghost of Crow Cavern’ would make a fantastic animated film. We hope you read about Cheswick, Brutenuts and the gang!